This soup is so satisfying and hearty! You can either eat it as a side dish or as the main meal, which I tend to do. 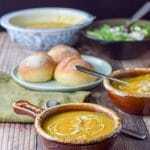 I usually take a slice of crusty bread and dip it right into the delicious squash soup!! 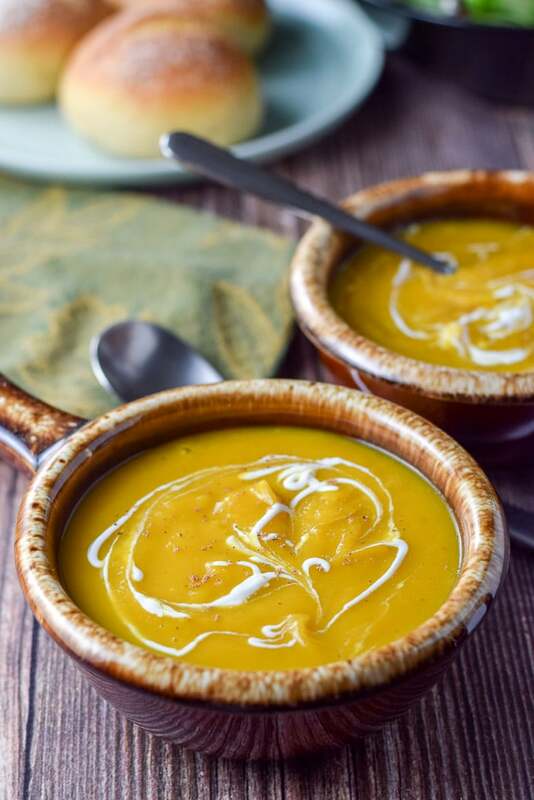 One of the things I love about this squash soup is it’s full-bodied, comforting and can be eaten either with spice or without. I would put spice in it if Christopher could take the heat but I can’t. So what I usually do is shake a little chili powder in my bowl so I can have the best of both worlds. 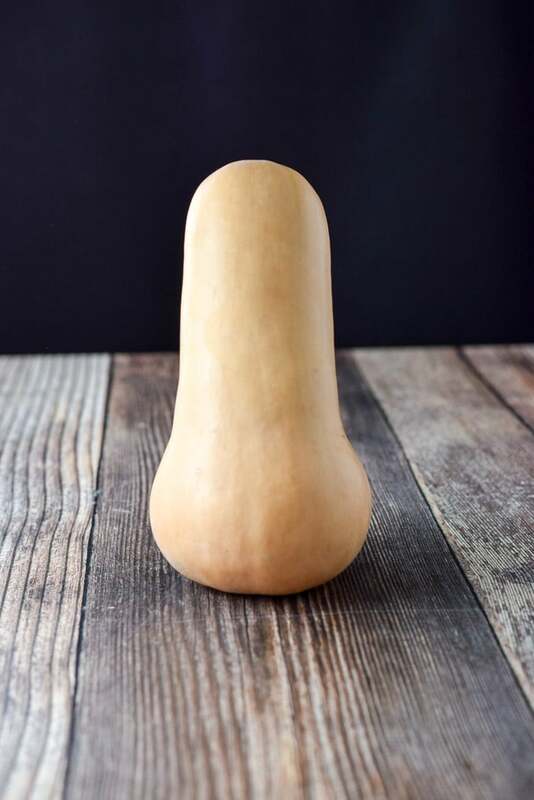 So, I start with a good sized butternut squash. It should be heavy for its size and blemish free! In any case, isn’t the above squash a beauty? One thing I don’t like about butternut squash is peeling it. So, getting that residue on my hands is almost too much because it totally dries out my skin and I never really feel like I get the residue off. But, with that said, I can tell you that I would brave the reside and dry hands for this scrumptious squash soup! Yessiree! I love butternut squash. In fact, I love every squash! But butternut squash holds a special orange spot in my ol’ thumper! So, I cut the squash up in 4 pieces and then I peel it. I wish I could wear gloves but somehow, I can’t seem to manage it and I end up peeling the glove. 🙁 Not fun, it’s like I lose all dexterity once the gloves get on my hands. After I peel the squash and wash my hands 5 dozen times, I cut it into little chunks. I also cut up shallots and get my garlic paste. I heat a stock pot on medium and take 2 tablespoons of olive oil and some butter and add it to the pot when it has heated up. Next, I add the shallots and sauté them for 10 minutes, just enough to get the shallots a little translucent. I put 1/2 cup of chicken broth in with the shallots and add the squash, garlic and salt. Finally, I proceed to sauté it all for 10 minutes, stirring periodically. And yum, yum, yum, squashy goodness! Next, I add the rest of the broth and lower the heat to a simmer for 40 minutes. We are on the way to a finished product, peeps! Time to clap our hands and do a little jig! After it has simmered for 40 minutes, I try a piece of squash to make sure it is done. You can either transfer it to a food processor or use an immersion blender because we want it nice and smooth!! I use the immersion blender. I ladle the squash soup into my tureen and dribble some sour cream on top! Look at that golden goodness. Now, that’s what I call comfort food. Nice warm squash soup to warm the cockles of your heart! In fact, I’m smacking my lips just looking at it! All that is left is to ladle the easy butternut squash soup in a crock and enjoy! Overhead shot, just to be thorough! So, I hope you enjoyed this easy butternut squash soup recipe. Please leave me a comment because I’d love to know what you think. 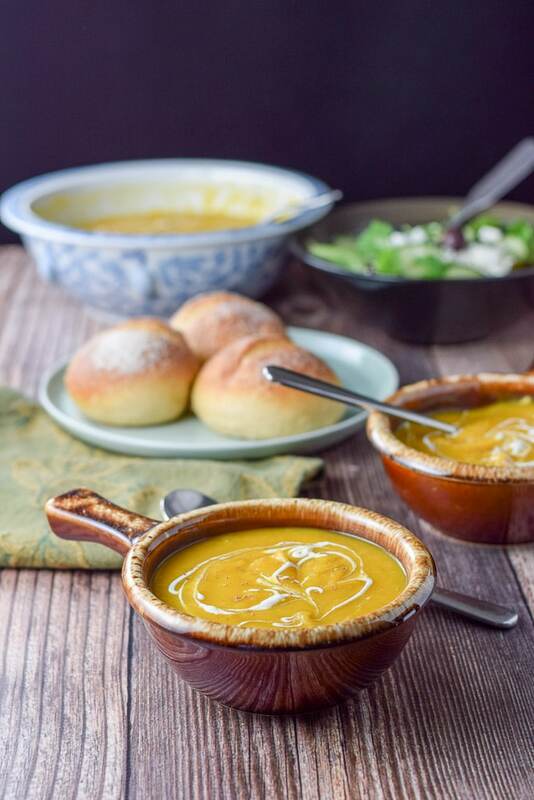 If you’ve tried this easy butternut squash soup or any other recipe on the blog, I’d love the hear what you thought about it in the comments below. I love hearing from you! You can also FOLLOW ME on FACEBOOK, TWITTER, INSTAGRAM and PINTEREST to see more of my delicious food and delightful cocktails! 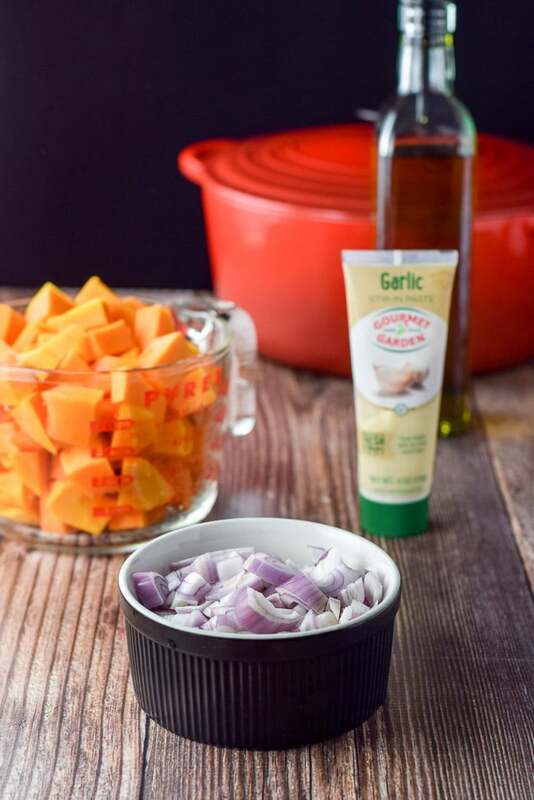 This delish comfort food bowl of squashy goodness is a treat to eat!! I can’t stop staring at this gorgeous soup, the swirls are so pretty! So much to love about this creamy, dreamy soup ! What a comforting soup…this looks absolutely beautiful! This looks so gorgeous, and love the simplicity of it. I’m going to use extra nutmeg, my favorite. The photography is stunning. Thank you so much Teri! That means a lot to me! “Stop yapping and start cutting” … also said by my wife many nights around our house! lol. Love this recipe. I have only ONE squash left from our garden. Maybe I will try to make this. I could certainly use a big bowl of this delicious soup right now! It’s been cold here in North Carolina. Your pictures look beyond amazing! Thanks for sharing this recipe- I’m going to try it this weekend! Thanks so much Jessica, that means the world to me! Be right there Sarah! I hope the bowls and utensils are ready! 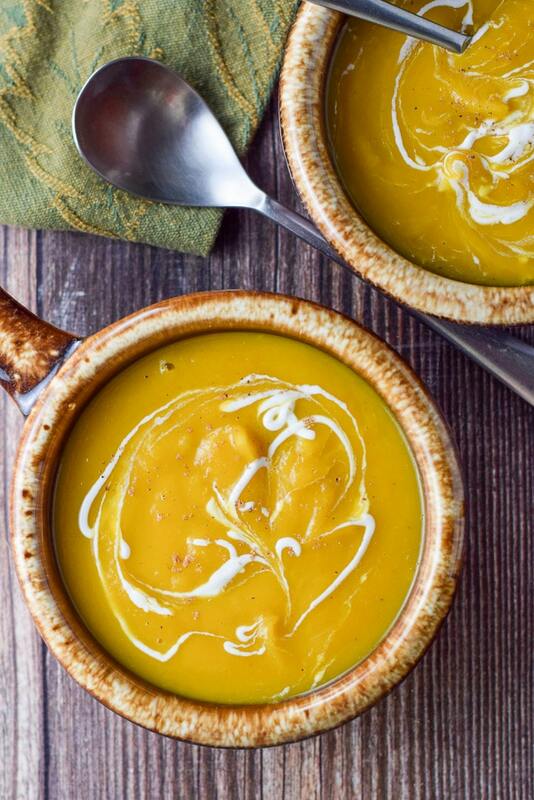 I am always looking for a new squash soup recipe ..yours looks great! Thanks Paige! I appreciate it! With the cold winter months here, soup will be happening for sure over the next few months. 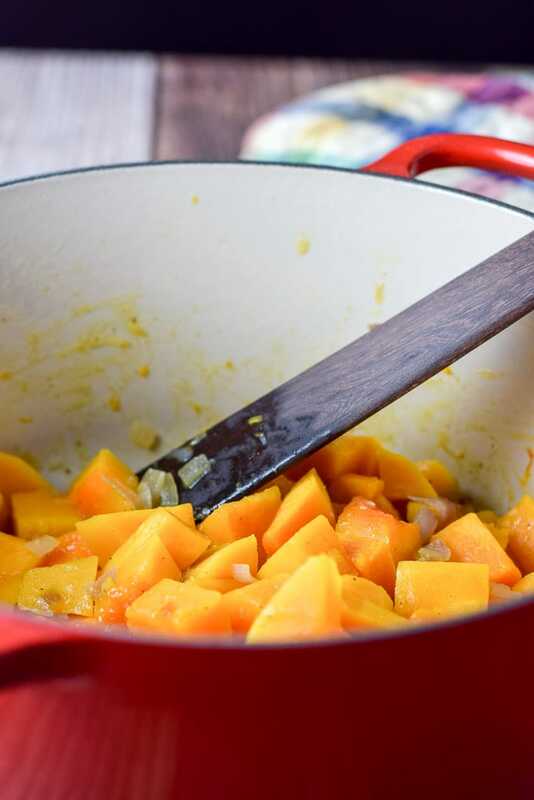 I love squash, and squash soup… and this sounds and looks delicious. 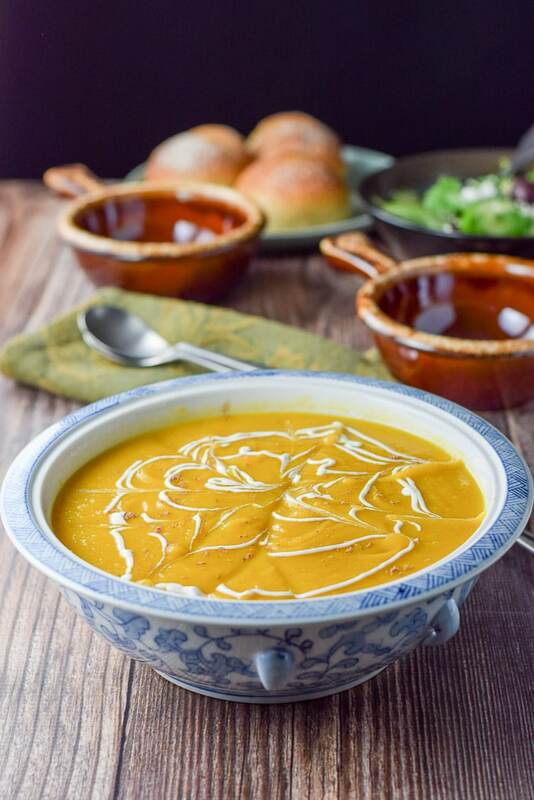 The consistency and color of your squash soup is a dream! This is something that I would make for dinner too and in fact I make it the same way. except that I have always used pumpkin as we don’t get squash here. Mmm. Pumpkin would be awesome Helene. Thanks for your comment. The soup looks fantastic! Thanks for sharing! Nothing beats a hot bowl of scrumptious soup!! It’s cold rainy and windy here and this soup would be perfect. Love how simple and easy this is. i love butternut squash a lot too but peeling them is not my fav either…this looks so comforting!!! What a satisfying soup! I love it. And a little sour cream is the perfect garnish. This recipe looks SO good – even though I don’t like sour cream, I love the gorgeous swirl of it on top! Thanks Karyl!! Indeed it is! A bowl of this would absolutely hit the spot right about now! With the cold weather we’ve been having here in New York lately, this soup would be a welcome addition to our dinner table! Squash has been on my list of foods to try for a long time, but I never have worked up the courage to do it. This looks so tasty and cozy I might just have to give it a try! Thanks Claire. It’s a sweet veggie and fun to slurp down as a soup! I’d definitely eat this all winter long but your description of raking season and bare trees makes me miss fall so much (even though it just ended.) This soup looks lovely. Thanks so much Jenna! I appreciate the comment!